Scott discusses the resurgence of miniatures gaming in the Gettysburg area in his editorial. In the second part of a three-part series, George Anderson covers the Battle of Atlanta in a scenario designed mainly for Johnny Reb. Anderson has an excellent historical introduction to the scenario. This is a rather large scenario and probably shouldn’t be attempted by new players. The map is 5×7 feet. Scott Mingus writes a background article on John Hunt Morgan’s raid into Indiana in 1863. Morgan ended up getting captured on July 26, 1863 in New Lisbon, Ohio. updated by Scott Mingus, Sr. This scenario article covers the small Battle of Corydon, where members of the Indiana state militia ambushed Morgan’s men. The scenario is very small, with a brigade on each side and only a 3×3 foot map. This one looks good for beginners. 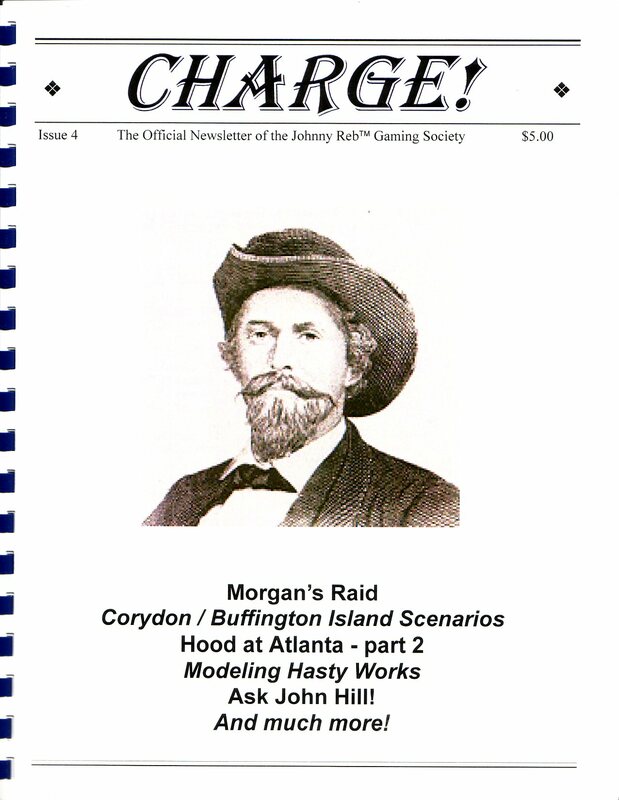 It originally appeared in the Johnny Reb scenario booklet and has been updated by Scott. Scott updated this scenario depicting a portion of Morgan’s Raid as well. It originally appeared in “A Clash of Sabers”, which is one of many scenario booklets for ACW miniatures gamers written by Ryan Toews and George Anderson. This is a medium sized scenario with some naval units involved on a 4×7 foot map. In this section, the editors review products associated with miniatures gaming. In this particular issue, Sanath Fernando’s painted miniatures are covered. Sanath, based in Sri Lanka, has a website at www.miniaturelovers.com. In this bonus section, Johnny Reb creator John Hill responds to gamer questions to clarify rules. Doug Rogers writes an interesting AAR describing the action in this scenario, which originally appeared in Scott Mingus’ Enduring Valor: Gettysburg in Miniature Vol. 2. The game was played on May 15, 2004 and was sponsored by the North Coast Historical Wargamers of Lake County, Ohio. This handy chart takes real-world distances in inches and feet and converts them to Johnny Reb scale yards, feet, and miles. Terrain guru Doug Kline handles a discussion of hasty entrenchments during the war including their effect on defense and attack. He follows this up with a specific discussion of hasty works in JR3 games. Burkhard discusses techniques for modeling realistic looking roads in ACW miniatures gaming.